I haven't been posting for a while, partly because of the holidays, partly deadlines for other work and partly because I'm pondering a new business venture. That sounds a bit pompous I suppose, but it is all I can think to call it. I've been taking photographs for over 30 years and probably have around 10,000 photographs in the form of black and white or colour negatives and as transparencies. Some of the older transparencies have begun to fade and some appear to have fungal growths on them. In an attempt to save them I started scanning them and in the process began to get a bit more confident in my use of Paint Shop Pro and Photoshop Elements. I realised it was possible to do much more when I found Fotolog. I very much recommend that you have a look. As a result I started going beyond simple restoration to produce digital images which I think can stand in their own right - they are neither photographs nor fake paintings. I have a Fotolog site which now has about 100 images of mine. As the images above show, it is possible to produce absolutely abstract images - although these have the look of infra red aerial photos that is accidental. They were not produced by raytracing or similar software but by direct manipulation of a particular image. 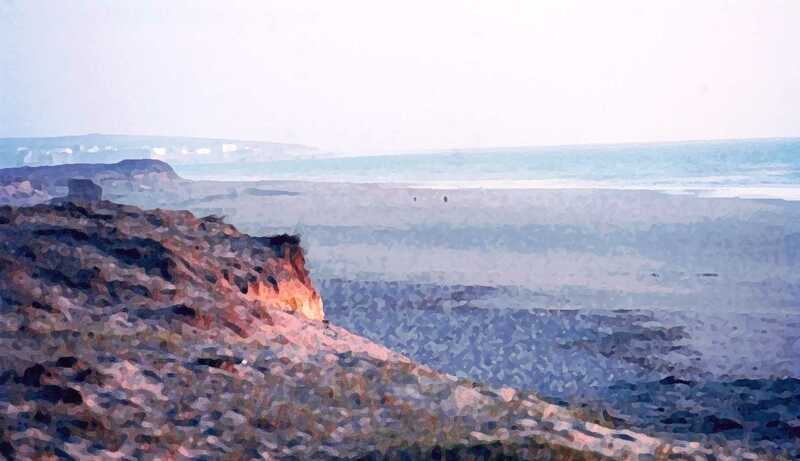 It is also of course to produce images which are recognisably rooted in real things like the picture below of a Morroccan beach, which despite my best efforts does have a painterly feel to it - by accident, since the effect has arisen as a result of my attempts at restoration. I'm not vain enough to think I have invented this way of working, but it does seem to fall into the cracks between more conventional artforms and I'm not entirely sure how I might begin to generate an income from these images. If there is anyone out there with some ideas I would love to hear from you. I'm trying EBay at the moment. and of course if anyone sees a picture on Fotolog or in my TypePad albums I would be happy to oblige - very reasonable rates for Panchromatica readers and I take PayPal!